At Work Design Magazine we are always on the lookout for opportunities to chat with our industry colleagues and thought leaders. At this year’s NeoCon, Primo Orpilla, FIIDA, principal, Studio O+A was a panelist for the presentation “The True Measure of a Space is How it Makes Us Feel”, an excellent discussion moderated by Jennifer Busch, and included Dr. Sally Augustin, and Collin Burry. After the busy week of NeoCon, we were able to connect and have a great conversation to follow up on some of the topics (and more) that came up at that event. As companies take more initiatives to look at the whole employee experience, how much does space design inform that process? When we first engage with a client, we try to understand what the company wants from their space. 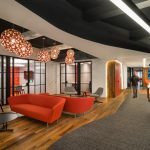 We all recognize the desire to use workspace as a tool to recruit and retain, but more significant is helping them define their corporate DNA and determining what makes them different. We want to help them figure out how to express their values and utilize design as a driver for the company. A lot of our interactions and engagements come at the beginning or middle of a company’s growth trajectory. We may begin our work with them when they are a startup or be called upon to work with them when they may be in the doldrums, and their space doesn’t inspire anymore. Sometimes a company’s first space no longer reflects their identity, or a larger office has not kept up with the evolution of their culture. We need to work with them to research and identify their current DNA and find the story that will tie to a narrative that we can translate into the design of a space. Robust design is rooted in that story. It is about where they were when they were discovering who they were as a company. We can use the power of design to send that message. The look and feel of a space may be something you haven’t seen before; it may be expressed through the materials used. At O+A we want to create a space that provides a memorable experience that evolves from a thoughtfully considered design discussion with our clients. There is no room in our portfolio for a “soul-less” project! Are there any differences in how you approach a project depending on what point you are asked to work with a company? Does a startup engage with you differently than a more established client? Moreover, how they relate to the space around them. In many startup cultures, the younger-skewing workforce may only understand workplace in the framework of a college campus. People tend to bring with them the vernacular of being able to work anywhere from the dorm, to the library, to the student union. The concept of working in a cubicle is foreign. They are free spirits and can find a place to hunker down in multiple environments either open or quiet areas when they need to do serious work. In the early days, there were situations where there were massive amounts of people with no order – this is where we needed to start strategizing. 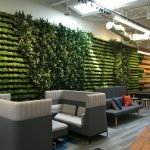 We needed to work with our clients to “guard the space plan.” By this, I mean that we had to design spaces that could keep on growing and change over time in a way that made sense as the company matured. We worked to put protocols in place to ensure that the workplace could function as it expanded and still provide a good experience for the workers. Those startup clients have become entrepreneurs and continue to be our clients to this day. Doing larger scale projects still requires the investment in the time to develop the design program appropriate for the unique needs of the client. Having a well-defined structure and strategy in place is critical for the success of any project. The process is essential, and we work hard on that aspect of our work. What kind of follow up do you do once a project is completed? We are always curious about how companies measure the effectiveness of their workplace design, but it seems to be hard to quantify. We are fortunate that our clients stick with us! We have had the luxury to take stock of what we do and have a robust internal peer review process. There is always “day two” work so we can often see how space is being utilized and can gauge what seems to work (or not). Post-occupancy is a tough question, and there is limited substantial evidence of how to best measure engagement concerning space design. There are a lot of emotive aspects of how people relate to the space they occupy, and everyone has different rituals and behaviors. That is why it is hard to get the metrics together. Evaluating the productivity of workspace is challenging as there are not common denominators for measuring that. Spaces evoke an emotional response. A classroom of students will create a mood board using images from Pinterest or Google; they will take photos of their favorite places. It is interesting to see the results. People experience space differently but are not good at explaining it! Measuring how people feel seems to be difficult to quantify. What are your ideas on how design firms can help their clients find a better way to evaluate and move these efforts forward, so the analysis is based on facts (if possible)? How can we do that? Figuring that out is probably our Holy Grail. We are not good at documenting what the quality of space can do. We know people react emotionally to the environment they are in, we just have not figured out the best way to capture and measure the emotional response to the aesthetics of a workspace with a scientific method. We can measure the effects of light, and environmental factors as Delos is doing, but the emotional aspect is harder to capture. People use space and work in a way that sometimes has nothing to do with the way space is designed. Designers make assumptions during the design process (based on conversations with the client), but when space is occupied, the occupants may do things in an entirely unexpected way. What kind of checks and balances do we put in place to make sure design solution work? We all jump in with the necessary knowledge….will the tech help us understand the use of the space? What about all the sensors that are integrated into new spaces? There will be a time when all this tech will provide more information to help us design better. We are in a market where a lot of bright engineers, especially here in Silicon Valley, cultivate an entrepreneurial spirit. We see that in these tech-focused offices; people want to make space their own. We give people different environments. Northern California businesses are early adopters of new technologies, break-out ideas. Younger entrepreneurs are more willing to experiment and see what may work. The workplace is one place we can focus on making some changes. Everyone is interested in finding out how to make work better; older companies are expanding globally. We live in a world of “not your father’s office.” Work in a startup is where values need to align with the design of the space– it is part of the competition for talent. Space needs to say, “do good work.” The value proposition is extending in the workplace, and these newer, young companies are being good stewards. As companies are making more of an effort to consider that “one size does not fit all” and that they need to provide space not only for the tasks at hand but for the variety of people that make up their workforce. Where can we separate “trend” from the evolution of sound design principles for the workplace? We aspire to a level where the best intentions and reality meet what a business is trying to say. We are reaching for design, look and feel in the workplace that is all about who the client is. We want to be a part of that conversation, as we develop the design program and work with our clients to curate their environments. Our design values are based on living and working in Northern California, and that informs the way our practice thinks. We want to make workplaces better. The design comes into that, but we want to understand better how space shapes behavior and how companies tell their employees that they value them by providing the best places to support their work. Teaching is important to me. I think the most exciting thing for me about teaching is you really—you’re getting someone who thinks the design is one thing and what I’m best at is saying, “Well, that’s part of it, but you need to think of these other things as well.” What students often do is see a problem and solve a problem right away. My job is to make them think before they begin answering all the questions. It seems very simple, but it’s so easy to jump to conclusions. Your goal as a designer is not to always assume the first thought is the best thought—and that’s especially true when you’re a student. When I was in college, one of my favorite classes was Critical Thinking. It was all about questioning assumptions, questioning the information that comes because you don’t know what the source is. Moreover, when you’re using an algorithm to find photos of what’s the best kitchen, what’s the best office, that algorithm is developed by somebody else who’s using a specific set of things to cultivate the information, and you’re not building your filters and your way of cultivating information. I want students to take the pictures themselves. I want them to find it in the library. I want them to read about and source the information through their search engine. Not somebody else’s. It’s the difference between buying something off the shelf that’s already put together versus building all the pieces and making it yourself. There’s satisfaction there that is very gratifying. Acoustics play a HUGE role in how a space feels and how people are productive within it. No mention of issues of noise & sound in this article. Was it addressed in the Neocon event “The True Measure of a Space is How it Makes Us Feel”? Too often ignored in the design phase – when great products are available to be incorporated into the vision – left for post-occupancy “fix”!